Hi sweet friends – where did the last month go? I’m back with another die of the Month and looking forward to a busy February!! This month I am sharing – a die called Enchantment Tall Flip and Gatefold Card, it’s the Amazing Paper Grace February 2019 Die of the Month. P.S. 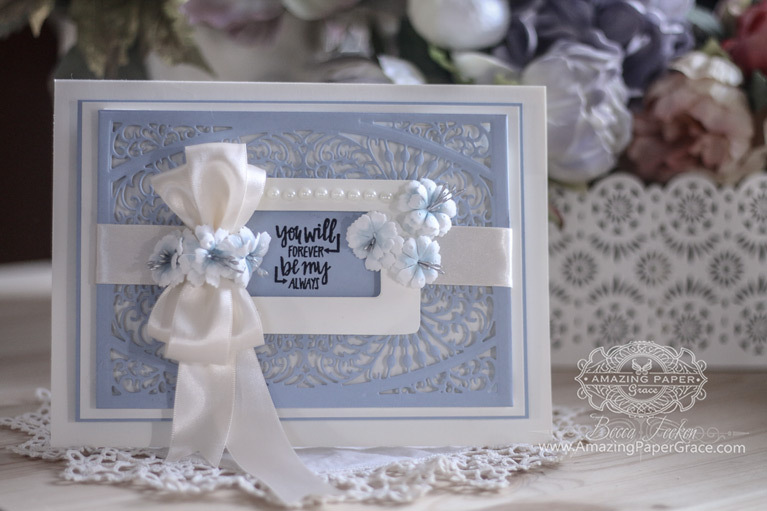 Let me share this before I forget — The Amazing Paper Grace Creative Team and I will be introducing you to Shadowbox Vignettes in a Blog Hop on Monday, February 4th at 9:00am right here! Many of you have been asking when this collection is coming and I’ll share all the deets! I love a die that can transform and do different things. In December I introduced a square gatefold card that could easily be parlayed into a gift basket for an ensemble look. For February, I’m introducing a tall 5 x 7 rendition of that kind of die. My initial thoughts were to make a Gatefold Card, use it for a Card Background, make a Basket, and cut out the pattern for candle wraps. I know there are many more ideas that but I was loving where it was all going! For my first project I created an easy to make card using the complete die set (minus inner rims) for a background. With this die I can pick and omit which dies to use for a different look because there are 6 different inlays that can be used inside the card. Here I have made an easy gatefold card by combining two panels. This is my favorite project with the die – and that is to use the folded panel as basket handles. This makes the cutest basket ever – perfect for candies or pencils or even to deliver a batch of cookies! And there you have it!! 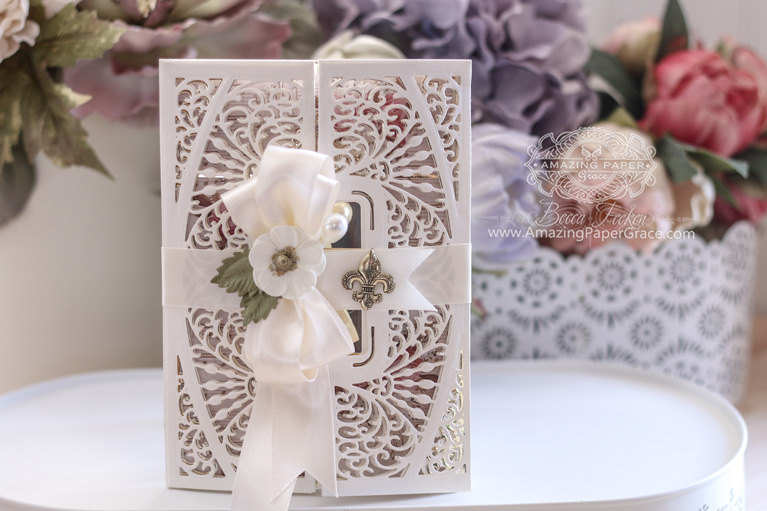 Pop over to the Spellbinders Blog to ——>THIS POST <——– to have a look at many more pictures of the Enchantment Tall Flip and Gatefold Die. If you are already a member or have purchased any of the Die of the Month Dies, I hope you’ll leave a review of the die on the Club Page. If you like the direction I’m going with these dies, please leave a comment on the Spellbinders Blog Post so that I can continue to create in the same vein. As always, if you have a constructive comment on how the dies work for you, please leave it – I read all of these and we discuss them as I plan additional designs. 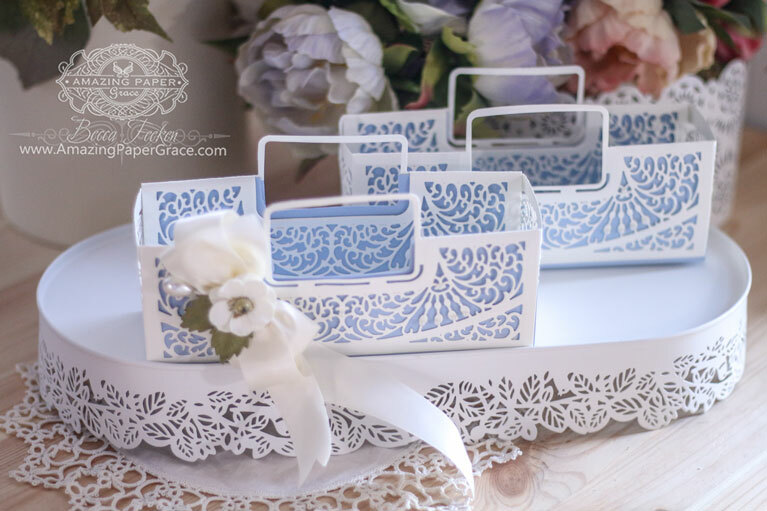 Accessories: Amazing Paper Grace Dies by Spellbinders, Spellbinders Foil System, Amazing Paper Grace February 2019 Die of the Month. Thank you, as always. 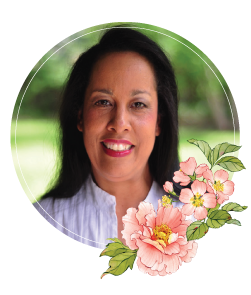 This is my passion and I’m so tickled to share it with you! Good morning Becca, just beautiful and the colour you’ve used is delicious. Loving the teams efforts too!!! Oh Becca this is another beautiful die cut. Thank you so much for sharing how to make the basket. Will need to make for Valentines. Absolutely beautiful! Do you know you truly are amazing? I am totally smitten with these dies. So thoughtful and your creations are gorgeous! Delighting in new creations every month is happiness beyond words. Wow Becca, these projects are absolutely stunning! You have another huge winner with this set. The shadowbox die is so creative. I love the end results and the beautiful embellishment. Very elegant.